Today, I want to talk to you about my latest adventure : the Oh-my-god-I-want-to-knit-myself-a-sweater adventure! It started a few weeks ago; the weather has been warming up a lot here recently, and the snow is slowly melting away. It smells more and more like spring every day, and the warmer days inspired me to retire my winter coat for the season and use lighter and more colorful clothes to match the nice weather. That said, I have been CRAVING a hand knit sweater so bad that I just couldn’t resist when I saw the most scrumptious blue balls of Bamboo Pop yarn I found as I was out shopping, so I bought 4 balls, and set off on a new adventure! Now, I must mention that I have never in my life knitted a sweater. I sew a sweater once or twice, but never have I actually knitted a piece of clothing other than a shawl, a scarf, socks or hats. I have never knitted a swatch either, because size has never really been an issue. Who cares if a scarf is 9 or 10 inches wide, really? And to top it all off, I had so many unanswered questions, like how exactly am I going to shape the shoulders? Or the neckline? 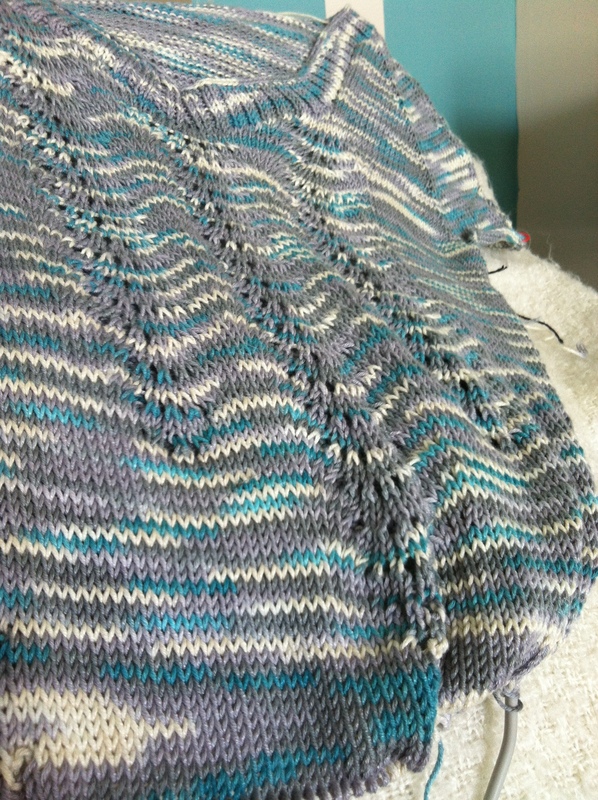 To give myself a better idea of what I was getting myself into, I first started by looking at sweater patterns, but I quickly realized it probably wouldn’t be a very good idea because I (very honestly) couldn’t visualize how it would come together. I really felt that if I just blindly followed the instructions given on a pattern, the sweater I would make wouldn’t fit as good as it should because it wouldn’t be adapted to my own body and measurements. After coming to that conclusion, I instead decided to look for videos or tutorials on how to make your own sweater from scratch, and I found this very helpful series of videos from Knitpicks on YouTube that showed me exactly what I needed. You can find the first video of the series here. I learned in that series of videos how to swatch, calculate my stitch counts and how to shape the sweater according to my body measurements and my knitting gauge. Strong from all this new information, I grabbed a pair of needles and my yarn and I started the project. Instead of making the sweater bottom up like they suggest in the video, I decided to adapt it to make it top down. I have never made a sweater before, so I have no idea if I have enough yarn to make a long sleeves sweater or not. By doing it top down, I can simply adjust the length of the sleeves the match the amount of yarn I have left at the end, so I figured that would be the most appropriate way to do it in my case. Wade and I are going to Cape Cod for the weekend to let off some steam and relax so I’m not sure if I’ll be able to finish it before we leave or not, but if I can’t, I’ll make sure to update this post later to show you guys some pictures of the finished product. This entry was posted in Crafts, Knitting and tagged adventure, craft, knit, knitting, sweater, yarn. Last December, my boyfriend and I went to Ohio to visit his family for the holidays. We had a really good time with everybody; good food, good times and good laughs, but one of the things that I was the most excited about was that I got to try my hand at weaving. I have never tried weaving before, not even once in my entire life, and although I have been sewing for 10 years, to me the art of creating your own fabric from scratch has always been cloaked in mystery. Lucky for me, my boyfriend’s mom is a veteran weaver, and she was nice enough to spend 2 days showing me the basics of weaving. 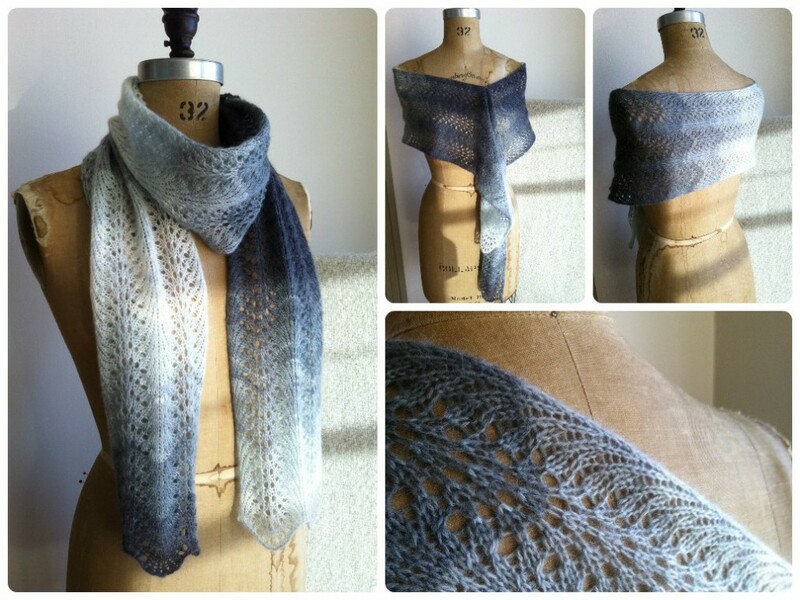 As I had absolutely no idea what I was embarking myself in, I couldn’t imagine what the finished product would look like, and chose the loom, the yarn and the pattern I was going to use a little haphazardly. Based on my future mom in law’s advice, I used a Leclerc counterbalance loom, a variegated, fuzzy purple yarn and a twill pattern. And I set off! Little did I know though, how strenuous warping a loom is. Holy crap on a cracker! 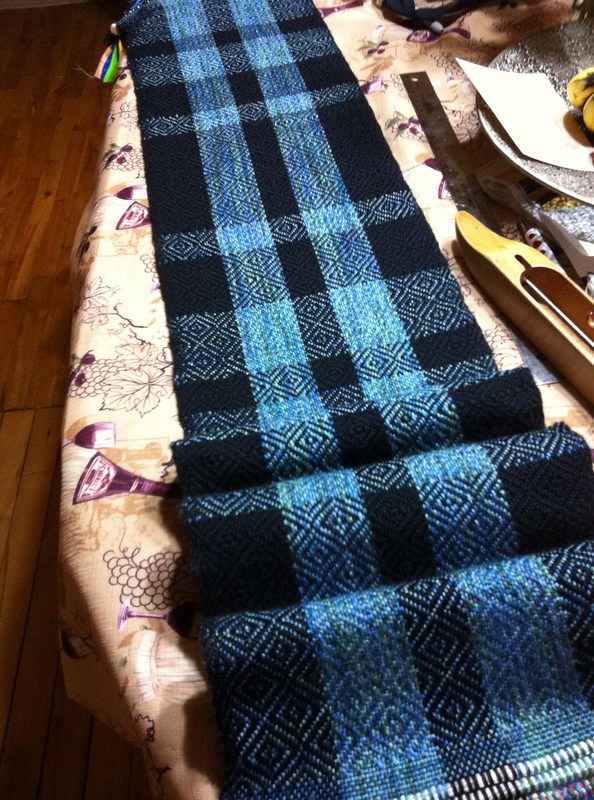 For a 12 inch wide scarf, warping the thing took an entire day! I couldn’t believe it! Ok, part of the reason why it took so long is because I’m a newbie and I had virtually no idea what I was doing, but still! I was so exhausted by the end of the day that I swore I would never touch a loom ever again. hahahaha the irony! The second day, I started the actual weaving, and much to my surprise (after the warping hell the day before) I really enjoyed it! 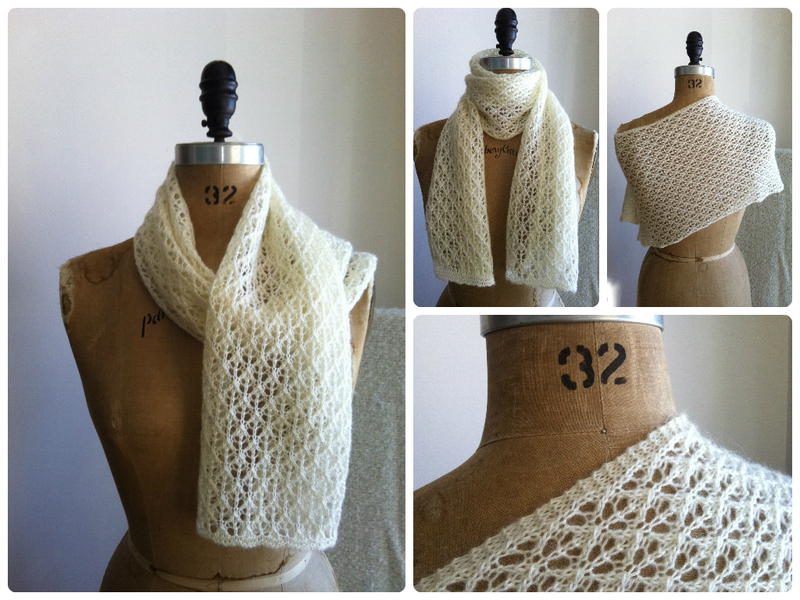 I weaved for 5 hours straight, and just like that, I had a brand new scarf! I just couldn’t believe how fast it goes once the loom is warped and threaded. And that is when it suddenly struck me : even though warping takes a long time, if I do it once and weave multiple projects, Oh THE POSSIBILITIES!!! So here starts the loom saga. I was so excited by my new discovery that as soon as I came home, I started shopping for a loom. Soon enough, I found a decently priced one, used but in good condition. A lady that lives an hour away from my place was selling it to make room for a different one. I was so excited to have found a loom so fast that my boyfriend Wade and I drove there on the weekend, and I bought it on the spot. The funny part starts as I was reaching for my purse to pay, and something suddenly struck me : the loom is a Leclerc 60″ counterbalance, and it comes with a bench; my car is a small Yaris. How am I going to bring it home? Well, if you’ve ever tried playing Tetris, I can tell you that a real life version is far more challenging (not to mention entertaining!). We spent 2 hours taking the loom apart, taking pictures and carefully labeling all the pieces, and we (somehow!) managed to fit everything into my small car (I heaved a sigh of relief). Wade and I got home, I was still pumped and excited about my new purchase, and we took all the pieces inside. Then, I took a moment to take good look at it. 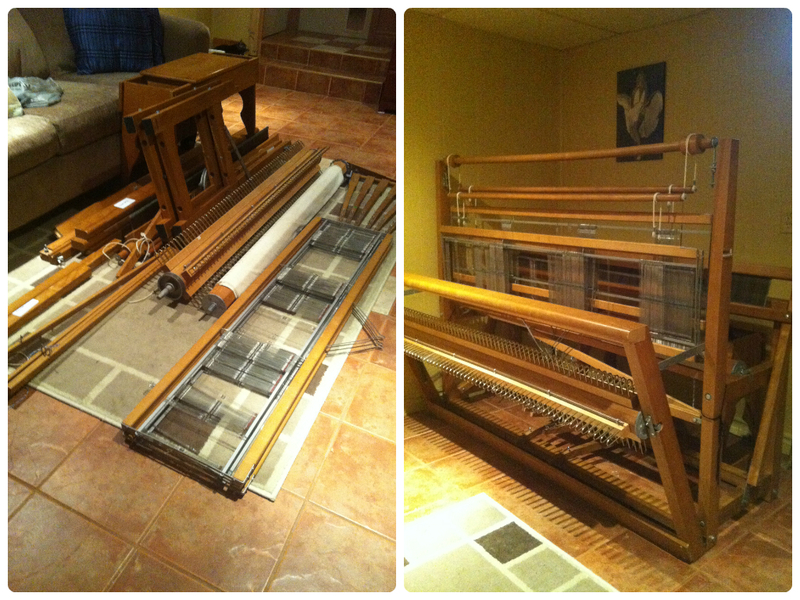 The loom is home, that’s great and all, but now… We have to put it back together hahahaha. It took a good 2 hours to make sense of it all and get it together, but we finally did it! For those who are interested, here’s a “before” and “after” photo, I can tell you I have never been so proud of my construction abilities! After finally putting it together, I tried a few things and made a few test pieces, I understand now a lot more about weaving, fabric construction and weaving patterns, I have been experimenting a lot with different colors, different types of yarn or thread and different patterns, very much so much that it starts looking like a weave-a-thon. But I’m enjoying myself, I feel creativity flowing and ideas keep popping in my head, so much I can barely sleep at night! But I’m really proud of what I can do now, and I get the feeling it’ll only get better and better. This whole saga just really shows that starting a new craft isn’t always easy, but as long as passion is driving you, you can really make the best out of it and make your learning experience worthwhile! 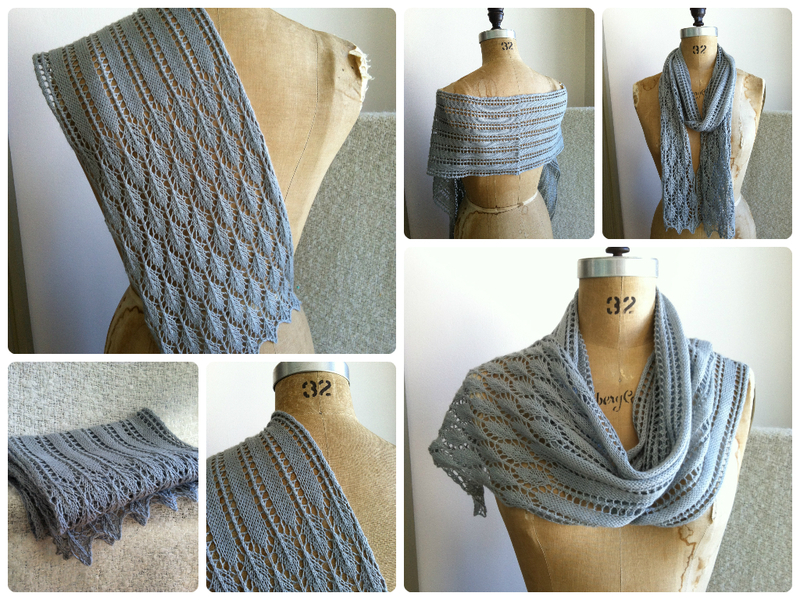 This entry was posted in Crafts, Weaving and tagged adventures, craft, loom, passion, weaving.